“Until recently, Zoey Redbird was an average high-school student worrying about grades, boys, and breakouts. But priorities have a way of changing when you're Marked as a vampyre, enroll in the vampyre academy House of Night, and have to figure out a whole new social hierarchy, affinities for elemental magic, and physiological changes that make you crave blood. I love reading graphic novels, because sometimes I just want to SEE the things I'm reading about. You can imagine things in a book, of course. But a graphic novel turns words into art. That's what I love about them. The illustrations in House of Night: Legacy are beautiful and really draw you into the story. The problem for me was that the pictures were the only thing keeping me reading the story. I found it to be just as abrupt and confusing as when I started reading the first House of Night novel. I'd hoped maybe reading the graphic novel would be better, would make me love the books or something. It didn't. But I did fall in love with the Legacy cover. It's gorgeous! 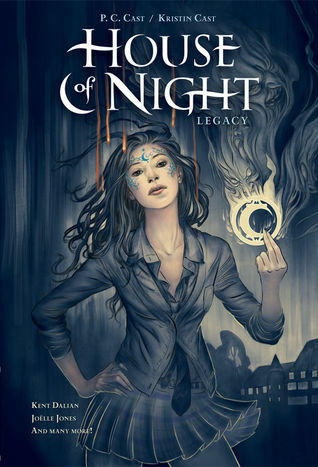 If you're a fan of the House of Night series, you will love Legacy. If you're not a fan, than this won't help change you're mind about it. But, like I said, the illustrations are beautiful, so if you see a copy somewhere, take a flip through and appreciate the artwork! For more about House of Night: Legacy check these sites! Great review! I'm not a huge fan of HoN but I did enjoy the first couple of books. I was debating whether or not I would get this one. I have seen some of the graphics and they definitely looked beautiful! I remember reading Marked a year ago, thinking it was decent enough to continue on with the series. But when I saw the extremely long list of books I would have to dedicate myself to go through, I called quits. Besides, wikipedia's summaries are so much shorter. It doesn't seem like graphic novels are any better compared to their original counterparts.